Tokyo, Dec. 28 (Jiji Press)--The Japanese government said Friday that it expects to annually spend 1,536.4 billion yen to cover costs for its free-of-charge preschool and tertiary education program. The estimate was presented to a meeting of related ministers on the day, where the government adopted a policy for drawing up details of the program. It plans to submit related legislation during next year's ordinary session of the Diet, the country's parliament. Prime Minister Shinzo Abe places high priority on the free-of-charge education program, which will be financed by the consumption tax hike to 10 pct from the current 8 pct, scheduled for October 2019. 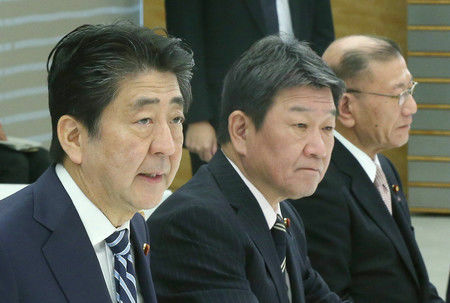 "We aim to revamp our country's social security system to an all-generation type that allows both young and elderly people to feel secure," Abe told the meeting. "Making education free of charge is a key first step toward this goal." Free-of-charge education and nursing for preschoolers are expected to start in October, with annual costs put at 776.4 billion yen.